Philadelphia Phillies starting pitcher Aaron Nola throws a pitch during the first inning against the San Francisco Giants at Citizens Bank Park. Aside from Rhys Hoskins' participation in Monday's home run derby and Aaron Nola's inning of work as the Phillies' sole All-Star Tuesday, there won't be any baseball for Phillies fans to care about until Friday as the annual All-Star Break is finally here. As we turn the page and start focusing with intrigue on the impending trade deadline and eventual pennant race this fall, lets pause to take stock on the best and brightest from the first half for the Phillies — a group that has somehow managed to stay in first place despite a meager +18 run differential (the Astros are +191, the Cubs +111). Even after his most recent outing — a 2-0 loss to the Marlins that saw him allow two runs in the first before retiring 18 straight batters — Nola is one of the top three NL candidates for the Cy Young award. 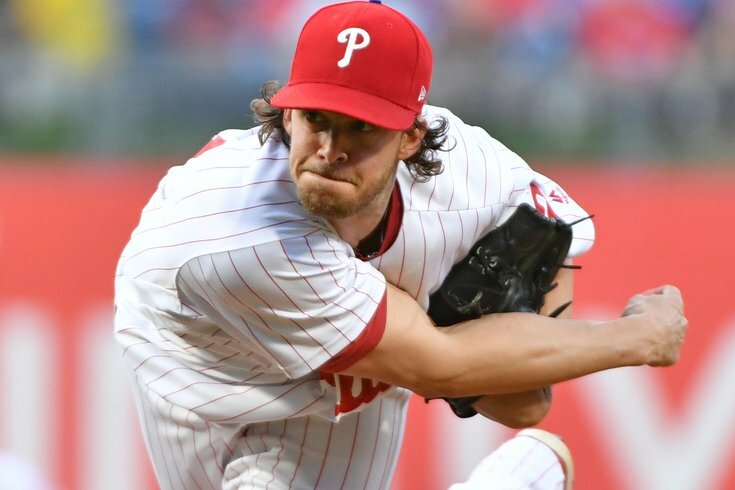 Considering the Phillies' slim margin for first place in the NL East, without their true ace firing on all cylinders Philly would not be atop the standings. He's fourth in the NL in strikeouts and third in ERA though the season's first half. Just before the season started, the Phils handed Kingery an unprecedented six-year, $24 million deal before the then 23-year-old had ever played a major league game. And while the deal could wind up a bargain if Kingery rounds into a big league staple, it is looking like a terrible short term investment. Kingery's lack of consistency and production with his bat is one of the main reasons the Phils are so heavily interested in trading for Manny Machado. Dominguez has been one of the most enjoyable players to watch this season, as he's embraced the role of de facto setup man — often times getting the most important three (or six) outs of the game while occasionally getting the save. Just 23, Dominguez has struck out 43 batters in 33.2 innings while allowing just six runs and one homer. If he keeps it up, he'll certainly find one of the more important roles on the squad as the summer continues. Hoskins' inclusion in the Home Run Derby is a good indicator of where the Phillies' outfielder stands in the hierarchy of major league sluggers. His on base percentage (.363) is in the top 35 of all big league hitters while his on base plus slugging rate (.819) is the best on the Phils. As the summer has heated up so has his bat, offering the Phillies a real threat in the heart of their order. Santana has six errors this year, but spread across his team-leading 794 chances over 814 innings (through Saturday), he has been the most consistent and important defensive player thus far. His .992 percentage in the field places him 17th of all defenders. First place at the All-Star break is nothing to sneeze at. And after the controversial start of the season by unconventional rookie manager Kapler, it's even more remarkable to see how his sometimes "over managing" has lent itself to winning ways. Kapler seems to be doing more with less, as the Phillies are hitting .237 — the sixth worst rate in all of baseball — yet somehow have the second best record in the NL. Thankfully, he's been able to maximize the impact of the pitching staff which as the ninth best ERA and third most quality starts in the majors.